Some people love leftovers and others hate them. I consider myself a god with leftovers and have often said that I could feed small countries with some left over meat, a pan and an onion. I'm the MacGyver of leftovers. Dave's not as good with them so I have to be very inventive; I view this a challenge! So when the phrase "That Goo is Good!" comes out of his mouth and it's regarding leftovers - eureka! You may have seen the previous blog with the Ribeye steaks, they were so huge we had one entire steak left. Steak can be tricky to work with the day after, especially if it's over cooked. But the great thing is that Dave cooked them so perfectly I had no fear of using it again. If you click on either of the photos, you can see how pink the meat still is- the key here is to add it at the very end just to warm it, you don't want to recook it! Looking for something out of the ordinary, I found a small can of green chili's in the cupboard and then paired that with a can of corn. This is not the direction I started in, which is so typical for me. I don't always know what I'm making until it's done. Below is the recipe and according to Dave- this is quite good! 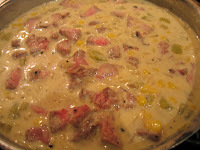 Corn and green chili really work well together. Of course, if you don't have left over steak feel free to substitute hamburger or chicken or even turkey. I'm all about using what you have- consider it my effort to being, or rather, eating 'green'! 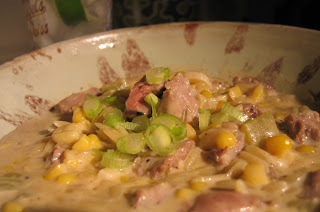 Serve immediately when the cheese is melted, top with fresh chopped scallions. Pair with a heavier micro brew like a black ale or go to the opposite extreme with a Tecate. How ever you serve it, rejoice with fabulous leftovers and be fat and happy!